Friday night football in Round 22 was a particularly special event. Not because nearly 77,000 turned out on a typically crisp Melbourne evening, with temperatures below 10 degrees. Nor because two outstanding teams (one well below where they should be on the ladder) played a brilliantly entertaining style of football. It was remarkable because football cemented itself as the space for public reason in Australia, at a time in which we are in desperate need of such a space. Public reason, simply, is the common ground on which a positive society can be established. In acknowledging the reality of estranged interests in faith, politics and ethics in a pluralistic society (i.e., a democracy), public reason serves to liberate all individuals from the alternative extremes: the necessity of consent or the tyranny of an homogenous culture. Public reason is employed when the foundations of a society are those that could be both understood and accepted by all citizens within it, establishing their social contract, and acknowledging all the while that many will have conflicting beliefs that cannot be reconciled. A space for public reason is formed when two individuals or groups with exclusive definitions of ‘truth’ can come together and legislate based on what is mutually reasonable. Too lofty a concept to be applied to football? Certainly not. Rather, football presently holds the status as the place where reason is expressed better than any other institution in our society. Bachar Houli and Adam Saad, both young Muslim men, strode out alongside their respective captains, Jack Riewoldt and Dyson Heppell, for the coin toss prior to the commencement of Friday night’s match. They shook hands with the opposing captains and embraced each other, with expressions that seemed to mix gratitude and grief. This brief gesture beautifully demonstrated public reason in action, and in doing so sampled its transformative power. Standing together in clashing colours, they conveyed a simple message: we love our country and game, and want to be seen as legitimately part of the former and thus able to confidently play the latter. Further, they exemplified how mutually exclusive ‘truths’ can co-exist harmoniously upon a platform of public reason. Houli and Saad have, in the football context, irreconcilable differences. Each would have wanted his team to win and each would have wanted to give the best performance as a rebounding half-back (a position they share). Yet neither needed to concede their desire for their own success in order to grant the other the right to fairly participate. A simple, but profound example of reciprocity in the social contract. Poetry in the prosaic. This expression of reason, which some have called a protest, was in response to the maiden speech of Senator Fraser Anning, in which he called for an end to ‘Muslim immigration’. In what was certainly not among the most eloquent speeches delivered to the Australian Parliament, Senator Anning also called for the ‘right to own and use firearms’, quoted Winston Churchill and, likely unknowingly, employed Nazi Party terminology that was used exclusively to refer to the systematic murder of millions of European Jews. He incorrectly attributed Islamic faith to both James Gargasoulas, who killed six people in Melbourne’s CBD, and the perpetrators of recent crimes in Melbourne’s outer suburbs. Disappointingly, Senator Anning’s speech could have easily been remembered for his appeal for working people to ‘have the right to expect a fair day’s pay for a fair day’s work… to get ahead and have a decent life… to provide for themselves in old age’, but his appeals to old racism and his division of society into those that deserve liberty and those that do not sadly, and rightly, overshadow any positive content within. This, a clumsy attempt at asserting a very rigid ‘truth’, can not possibly make a positive contribution to a democratic society. Of course, all democracies are, necessarily, founded in pluralism. This simple fact seems to be lost on those that call for a return to prejudices past, as if such could strengthen our society. Football, whilst showing its mortal limitations during the booing of Adam Goodes, has mostly flown above the pettiness and puerility shown by the politics of division. My team, the Auburn-Penrith Giants, sets the standard for what cooperation within our society could achieve: a team of mixed faiths, ethnic backgrounds, sexual identities and ages, that has improved its football achievements each year since it began. Monoculturalism did not help the team to succeed, nor did any forced consent on the part of some groups of players. Rather, creating a space for public reason, in which the common good and reciprocity (and winning games of football) is put above ‘truth’, has facilitated success. Since Round 22, we haven’t just had the establishment of the top 8 for 2018, we’ve also had the establishment of a new Prime Minister (and a previous one torn down). This far-reaching change was undertaken for no reason other than a personal disagreement, with the Australian people paying the price of having their parliament shut down with the currency of lost opportunity. Football clubs have had similar personality issues in 2018, yet no coach or captain has, as yet, been torn down in an effort to shift blame or avoid the work required to improve. No, football illustrates better than anything else, that the best cure to a poor 2018 isn’t merely a new face, it’s harder work in the 2019 pre-season. Football shows us that, as our reason dictates, we must focus on the opportunities to succeed and not allow the fear of failure to consume us. 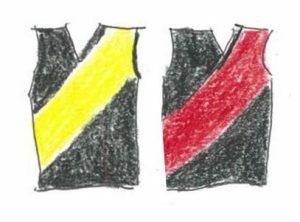 Our little provincial game, Australian football, has set the standards for discussion and cooperation since its inception, repeatedly singing, ‘come one, come all’. When Tom Wills first compromised on the rules of rugby in the development of Australian football, when Nicky Winmar lifted his guernsey and pointed at his skin, and more recently when, with a nation in the midst a postal vote, football exclaimed YES, football has presented itself as a place where discussions can take place, in which the common good can be achieved, and where division is the ultimate weakness. Watch the emotion, camaraderie and solidarity expressed by Bachar, Adam, Jack and Dyson in that moment last Friday night. That is public reason in action – all on the humble football oval. If only our national leaders played a little more football and a little less politics, perhaps we, and our democracy, would all be better off.